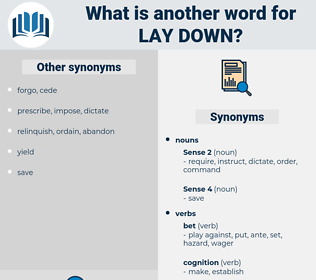 What is another word for lay down? request, implore, disallow, mismanage, ask. withhold, mispronounce, question, mumble, confine, muffle, repress, leave alone, hide, conceal, be quiet, deny. fight, overcome, overthrow, increase, climb, disobey, attain, reach, win, scale. overlook, help, forget, neglect, aid, prevent, disorder. reject, come, keep, hold, refuse, care, go, continue, maintain. unsettle, misguide, leave, mislead, confuse, mix up, disorganize. straighten, level, even, stand, be active, sit up, energize. worry, grow, agitate, irritate, excite, tense. forge, go forward, meet, forward, enter, face, advance, remain, take on, stay. waver, serve, misunderstand, plead, submit, miss, begin, start. dissuade, discourage, ruin, end, soften, liquefy, rise, destroy, hinder, ascend, halt, go up, finish. imply, decline, calculate, disagree, break, wish, break off. 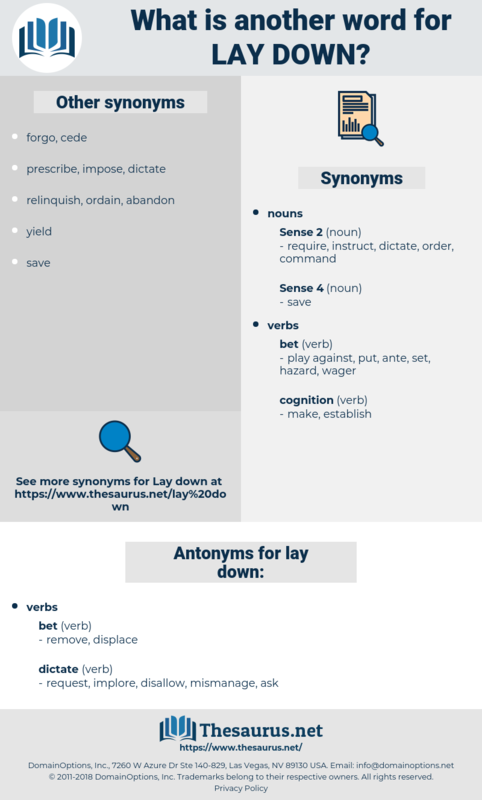 lead time, litany, louden, latona, laudanum, ladanum, lead-in, low-down, let on, ledum, lithotomy, lytton, lydian, lallation, let down, lithuania, leyden, let in, lateen, Ladino, laden, latin, lithium, lutein, latium, lutetium, ludian, Ladin, lodine, leiden, lithuanian, latino, latten, leaden, lawton, Low Latin, lotion, LTM, laotian, loaded down, lead on, load down, letdown, lie down, lithane.